Hébert, Gérard. "Strikes and Lockouts". The Canadian Encyclopedia, 30 May 2018, Historica Canada. https://www.thecanadianencyclopedia.ca/en/article/strikes-and-lockouts. Accessed 18 April 2019. A strike is the withholding of labour by workers in order to obtain better wages or working conditions. A lockout is the opposite, being the temporary shutdown of a business by an employer to compel employees to accept certain conditions. US National Director C.H. Millard with a group of union leaders in Hamilton, Ontario, in 1946 during the Steel Strike (courtesy National Archives of Canada/NAC-PA-120499). 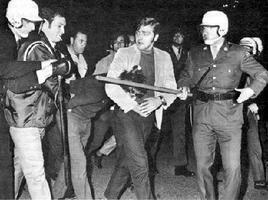 During the acrimonious strike of 1971, police clash with some 12 000 demonstrators (courtesy Montreal Star). A strike is the withholding of labour by workers in order to obtain better wages or working conditions. A lockout is the opposite, being the temporary shutdown of a business by an employer to compel employees to accept certain conditions. Both have been important in establishing the working conditions of Canadians over the last two centuries. Strikes are as old as subordinate work itself, and they occurred before workers were first organized in trade unions. For instance, the Irish canal builders of the 1840s were backed in their violent actions for better living and working conditions by their clannish secret societies. Their protest was crushed violently, as were most major strikes until the 1930s. Strike action is mentioned in 1836 by Toronto printers in favour of the 10-hour day, in 1855 by Montréal railway workers and in the 1860s by shoemakers in different cities. Strikes were generally unsuccessful; however, workers did make some inroads when economic activity was booming and labour was scarce. The most famous Canadian strike of the 19th century was that of the Toronto printers in 1872. It was part of a wider campaign for the nine-hour day (see Nine-Hour Movement). It lasted from 25 March to mid-May 1872 and involved more than 100 members of the International Typographical Union. The striking workers won the 54-hour work week and better wages, but the general campaign for the nine-hour day suffered a setback from the negative publicity surrounding the strike, and from the arrests that were made following a mass demonstration in Queen's Park on 15 April. A political debate ensued, and its outcome was the adoption by Parliament of the Trade Union Act, assented to on 14 June 1872. The act declared that unions were not to be considered associations that obstructed trade. The right to strike was thus implicitly recognized, but picketing remained a criminal offence until the Criminal Code was amended in 1934 to allow for information picketing. During the latter part of the 19th century, strikes occurred in the railway, construction, cigar-making and mining industries. Coal mining on Vancouver Island had experienced labour unrest since its beginnings around 1850. It reached its peak in 1903 with a five-month strike involving 700 employees. Other 1903 coal strikes were staged at mines in southeastern British Columbia and in Alberta. The early 1900s saw other major strikes, especially in railways. The most important was that of the Canadian Pacific Railway track maintenance workers from June to late August 1901, involving 5,000 men from the Atlantic to the Pacific. In 1903, another major strike in BC affected the CPR from February to June. These strikes prompted the federal government to adopt its first compulsory investigation and conciliation measures regarding industrial disputes. The Railway Disputes Act of 1903 inspired a more general and permanent legislation four years later in 1907, the Industrial Disputes Investigation Act. This remained the dominant piece of labour legislation in Canada until the 1930s. The publication of the Labour Gazette, beginning in 1901, also gave the public better information on industrial disputes. Throughout the 20th century, three waves of work stoppages were identified. The first two occurred from 1911–19 and 1943–48. The third wave took place from 1965–81, with a year of relative labour peace in 1977. Time lost through work stoppages, even at their peak, hardly surpassed one-half of 1 per cent of total estimated working time, accounting for much less time lost than that due to accidents or unemployment. The first wave of strike activity shows two peaks. The 1.8 million days lost in 1911 were mainly lost in the same industries as before: coal mining in western Canada and the Maritimes, textile and shoemaking in Québec, construction and railway throughout Canada. By far the most notable strike of this period was the Winnipeg General Strike of 1919. The confrontation on 21 June with the Mounties and soldiers, following earlier arrests and confiscation of documents, resulted in 30 casualties, including one death. The reasons for the strike were never clear, except that it was influenced by the general socio-economic and political climate and some similar action in Vancouver and the United States. 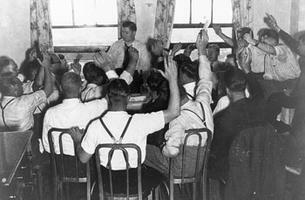 The One Big Union, established at the Western Labour Conference in Calgary in the same year, benefited from the interest arising from the Winnipeg events. After a few years of spectacular growth, however, the OBU quickly disappeared. Radical unionists lost faith in its ability to bring about change. Such disappointment — coupled with the Great Depression of the early 1930s — might explain the low level of strike activity until the second half of that decade. The textile industry in Québec became so troublesome in the late 1930s that a public inquiry was established to look into its difficulties. But the inquiry revealed only sore spots; instead of solving problems, it contributed to a province-wide strike in all of Québec's textile mills in 1937. It was the first major fight carried on by the Québec-based Canadian and Catholic Confederation of Labour (now Confederation of National Trade Unions). Its second and best known strike is the Asbestos Strike of 1949. Despite the government's severe restrictions on the right to strike in war-related industries, and the freezing of prices and wages, there were major strikes during and after the Second World War. Restrictions were lifted only on 1 December 1946, to allow the industry to re-adjust to peacetime production. The two most serious wartime strikes occurred in the aircraft industry in Montréal (1943) and in the auto industry in Ontario (1944 and 1945). The Ontario auto strike led to an award by arbitrator Ivan C. Rand that included the compulsory deduction (known as a check-off) of union dues from worker paycheques, which applied even to non-union workers. This has been known ever since as the Rand Formula. During the relatively tranquil period of 1950–65 there were still a half-dozen highly significant strikes, with one million working days lost in most of them. The railways were beginning their long decline, and their employees were fighting for their jobs, threatened by a technological change in the form of diesel engines. That period also saw the first strike by first-line managers for union recognition (the Canadian Broadcasting Corporation producers' strike in 1959), and the first of many desperate strikes against the introduction of computers in the newspaper industry. The workers belonging to one of the oldest unions in the printing trades were not struggling to obtain better conditions any more, but simply to keep their jobs. The period from 1965–1981 was a mixture of recurring old conflicts (involving primary metal workers, building trades and autoworkers) and also new ones stemming from public-sector unionization. The postal strike of 1965 forced Parliament to include the possibility of strike action in the 1967 Public Service Staff Relations Act. The biggest-ever work stoppage occurred in 1972 in Québec, when a Common Front of unions struck against the provincial government, the hospitals and the schools at the same time. The public-sector unions won big gains in money and benefits, but this was also the beginning of their loss of public support. There were also cases of essentially political strikes. A "Day of Protest" was called by the Canadian Labour Congress on 14 October 1976 to mark the anniversary of the royal assent of the Anti-Inflation law and regulations. A one-day general strike in British Columbia on 1 June 1987 protested against the proposed changes to British Columbia labour laws in bills 19 and 20. The slowing down of economic activity, starting in the early 1980s, almost wiped out any strike activity until the mid-1990s; workers were so afraid of losing their jobs they did not dare to walk out on their workplace. In the late 1990s, public-sector employees struck for both job security and economic reasons: efforts to wipe out budget deficits had hurt their paycheques. Aside from postal workers, who were on the picket line almost every other bargaining round, federal government employees had rarely gone on strike, mainly because they bargained in small separate units. Units were progressively regrouped and, in 1991, there was a general strike of 100,000 federal government employees. Special legislation ended that strike on 31 October 1991. In 2013 the government of Prime Minister Stephen Harper passed legislation giving Cabinet the power to set collective bargaining terms, including wages, at four federal Crown corporations. While some political observers welcomed the move as a way to reduce public sector wage costs, labour leaders called it an attack on the principle of free collective bargaining. In the closing years of the 1990s, there were strikes to block the downsizing of the public service at all levels of government, in different Canadian provinces. In 1996, to protest Conservative provincial government policies in Ontario, more than 250,000 union members and supporters picketed both public and private businesses in Toronto. The attempt to shut down the city was called the "Days of Protest." There are no accurate statistics on which province has experienced the most labour disruption, however, a general estimate reveals that BC has, in certain years, accounted for as many as half of all person-work days lost in Canada. In the 1970s, Québec took the lead with its all-encompassing public-sector bargaining structures. The other provinces have taken the lead, proportionate to their labour force, in successive periods. Until recently statistics did not distinguish lockouts from strikes. Both were counted as work stoppages, partly because some stoppages are both a strike and a lockout at the same time. In fact, lockouts were quite uncommon until the 1960s, and they are still much less common than strikes. Employers have always been inclined to use strikebreakers as their most efficient weapon. In the 19th and early 20th centuries some employers arranged to have an immigrant work force come from overseas to fill the jobs of the strikers. This often led to violence. In the spring of 1992, Canada's bloodiest strike-lockout began at the Giant Mine in Yellowknife, Northwest Territories. Royal Oak Mines locked out its workers at the gold mine after they refused to accept wage cuts, and brought in replacement workers to keep the mine operating. The Canadian Association of Smelter and Allied Workers union responded by declaring a strike. In the weeks that followed there were ugly confrontations at the gates of the mine property between unionized workers and company security crews. The conflict culminated in the murder of nine miners (a combination of replacement workers and unionized employees who had crossed the picket line) by striking miner Roger Warren, who was convicted of placing an underground bomb in the mine. The Canada Labour Code and most provincial legislation explicitly state that strikers must keep their employee status, and thus implicitly give a priority of rights to the striking employees. A few provinces have imposed a legislated position on strikebreaking. Since the 1970s, BC has forbidden the use of professional strikebreakers. In Québec it is forbidden to subcontract the work that is the object of the strike, and to use any employee (except local management personnel) to continue production during a legal strike. Ontario and BC adopted similar provisions in 1992, but Ontario withdrew that part of its law in 1995. See also Collective Bargaining ; Labour Relations; Labour Organization; Working-Class History. Labour Canada, Strikes and Lockouts in Canada (published annually until 1985, afterwards in Collective Bargaining Review); Gene Swimmer and Mark Thompson, Public Sector Collective Bargaining in Canada (1995); Jean Hamelin et al, Répertoire des grèves dans la province de Québec au XIXe siècle (1970); S.M. Jamieson, Times of Trouble: Labour Unrest and Industrial Conflict in Canada, 1900-1966 (1971).